The following is taken from the home page of our teaching website (as well as a page on this blog site), and greatly updated and repeated here because as Believers we all need to stand back every so often and examine our life style, our Christian walk (2 Corth. 13:5). Because of the fast pace of our lives it becomes common to focus on the details of our daily lives at the expense of the big picture. As a detail person, I am especially prone to missing the big picture and need to again read these words. 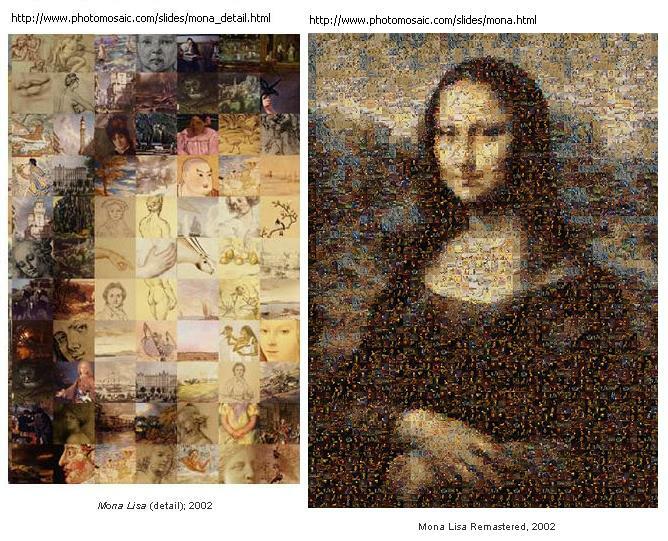 It has been said that a fast paced life can be like going to a museum and observing a massive photo-mosaic of the Mona Lisa, where hundreds of individual pictures are put together to make a large single picture of the Mona Lisa. Day-in and day-out we focus on the smaller aspects of life, what we need to do today, maybe next week, or even next month. It is when we take the time to focus and concentrate, and step back from seeing the small pictures of our daily life that we perceive the bigger picture of what our life really means. It is in light of this perception of the big picture that the following words were written. The most successful enemy of the best is not the worst; it is the second-best when it draws attention to itself from the best. On Christian websites, it is common to observe a focus on people in an effort to display a central theme of fellowship and relationship. Due to God’s wondrous design of man, wherein as men love their children, each generation tends to make life better for their children than it was for them. And in an age when Satan attempts to make everything relative; and change the meaning of words, is it any wonder that everyone has a different definition of what “better” is? However, becoming Biblically better is modeling Biblical Faith,wherein we keep Jesus preeminent in all things, while practicing to deny self (which is: “…dying to self…” ~ Luke 9:23 – where is that being preached today?) at the expense of putting others before yourself, and doing so all in an effort to seek God’s kingdom first, as opposed to our own pleasure and happiness. This is hard stuff – being a real Believer, a real Christian. This is our calling, how we are to live, how we are to walk through life. It is when tolerance means compromise, when excellence means winning at any cost; it is when society has learned to rationalize sinful behavior by neutering the Word of God, and the church follows suit; it is then that the Church of Jesus Christ loses its potency. We have seeker friendly congregations which have taken Christ from His place as the best, and substituted the narcissism of proclaiming that becoming better people and having better lives is truly what Christianity is about. We give sacrifices and deeds of wood and stubble (“For other foundation can no man lay than that is laid, which is Jesus Christ. Now if any man build upon this foundation gold, silver, precious stones, wood, hay, stubble; Every man’s work shall be made manifest: for the day shall declare it, because it shall be revealed by fire; and the fire shall try every man’s work of what sort it is. If any man’s work abide which he hath built thereupon, he shall receive a reward. If any man’s work shall be burned, he shall suffer loss: but he himself shall be saved; yet so as by fire.” ~ I Cor. 3:12-15), rather than live in obedience (“And Samuel said, Hath the LORD as great delight in burnt offerings and sacrifices, as in obeying the voice of the LORD? Behold, to obey is better than sacrifice, and to hearken than the fat of rams.” ~ 1 Samuel 15:22), because we trust Him and believe what He tells us to do is right and just; and what to do it. (“By faith Abraham, when he was called to go out into a place which he should after receive for an inheritance, obeyed; and he went out, not knowing whither he went.” ~ Hebrews 11:8). It is a lie of the devil that we will glorify God by “being all that we can be,” because that draws the attention away from Jesus, and back on ourselves. Unfortunately, the self-centeredness of our age has gotten to the point that the masses are leaving the mature Bible teaching churches in droves, seeking teachers that will further foster their self-centeredness though experiential emotionalism, seen in many hyper “spirit-filled” (where exercising “gifts of the Spirit,” [So they say – I have seen the true moving of the Spirit, and most of what goes these days, is not it – it is emotionalism and pride. Remember pride is preoccupation with self, it is self-centeredness, SEE ME!] are more important that the preaching of the Word of God – “I remember once after a service, the pastor saying it was such a good service, he didn’t have time left to preach the Word”) congregations, or as seen in such efforts such as the Emergent church (which is all about the “feelings” – the “experience,” the “emotions”), all seeking even worst false teachers. Many churches now focus on psychology and self-help which centers on man, as opposed to Jesus Christ – pastors using a few Scriptures only as props in support of their own presuppositions, not truly teaching the Word of the Lord, wherein these wolves in sheep’s clothing are devouring the flock, by keeping the focus on man rather than God (“For I have not shunned to declare unto you all the counsel of God [“The Word of God”]. Take heed therefore unto yourselves, and to all the flock, over the which the Holy Ghost hath made you overseers, to feed the church of God, which he hath purchased with his own blood. For I know this, that after my departing shall grievous wolves enter in among you, not sparing the flock. Also of your own selves shall men arise, speaking perverse things, to draw away disciples after them.” ~ Acts 20:27-30). Therefore, if you are in a fellowship that truly teaches “all the counsel of God;” the complete and unadulterated “Word of God” – Rejoice! However, many are leaving because they are starving to death spiritually, not being fed the Word of God; exiting in disgust because of the material and worldly presuppositions taught by many of these false teachers. The message that is forgotten is that Biblical Faith means totally and completely trusting God (to the point of losing everything, even your life ~ “Though he slay me, yet will I trust in him…” ~ Job 13:15a); rather than the perverse teaching of the day – that of the falsely named “Faith Teachers,” wherein they twist and misuse Scripture (leaving out conditions, qualifications, and most of all omitting the plain teachings of passages, such as 1 John 5:14, which states: “And this is the confidence that we have in him, that, if we ask any thing according to his will, he heareth us.” In the Greek grammar of this passage, “his will” is the focus of attention, not “we ask any thing.”), teaching that faith is believing God will give us everything we ask for. True Biblical Faith is believing that God is in total control of our lives, even when our lives seem to be a mess (See: Genesis 37:23-28 and compare it to Genesis 50:20; as an example). And that God, according to His Word is good, not an angry God, but loving to His children; seeking what is good for them in the long run, no matter how much it looks bad now (“And we know that all things work together for good to them that love God, to them who are the called according to his purpose. For whom he did foreknow, he also did predestinate to be conformed to the image of his Son, that he might be the firstborn among many brethren. Moreover whom he did predestinate, them he also called: and whom he called, them he also justified: and whom he justified, them he also glorified. What shall we then say to these things? If God be for us, who can be against us? He that spared not his own Son, but delivered him up for us all, how shall he not with him also freely give us all things? Who shall lay any thing to the charge of God’s elect? It is God that justifieth. Who is he that condemneth? It is Christ that died, yea rather, that is risen again, who is even at the right hand of God, who also maketh intercession for us. Who shall separate us from the love of Christ? shall tribulation, or distress, or persecution, or famine, or nakedness, or peril, or sword? As it is written, For thy sake we are killed all the day long; we are accounted as sheep for the slaughter. Nay, in all these things we are more than conquerors through him that loved us. For I am persuaded, that neither death, nor life, nor angels, nor principalities, nor powers, nor things present, nor things to come, Nor height, nor depth, nor any other creature, shall be able to separate us from the love of God, which is in Christ Jesus our Lord.” ~ Romans 8:28-39), and that in spite of the current pain, suffering serves a greater purpose (“Wherein ye greatly rejoice, though now for a season, if need be, ye are in heaviness through manifold temptations: That the trial of your faith, being much more precious than of gold that perisheth, though it be tried with fire, might be found unto praise and honour and glory at the appearing of Jesus Christ” ~ 1 Peter 1:7; and “My brethren, count it all joy when ye fall into divers temptations; Knowing this, that the trying of your faith worketh patience. But let patience have her perfect work, that ye may be perfect and entire, wanting nothing.” ~ James 1:3). Biblical Faith is not merely to be seen as a tool to garner things and desires (and yes there is always a place for petition, but not as preeminent; “trust is what is to be preeminent concerning faith”); but instead means trusting God – that He is in “total control” of the believer’s life, and that nothing can happen that God has not allowed (Matthew 6:25-30). What Biblical Faith does is more than a tool; it establishes a relationship, a relationship with God as our Father. Faith cannot be separated from its function as a conduit for relationship, wherein we become children of God (“Having predestinated us unto the adoption of children by Jesus Christ to himself, according to the good pleasure of his will” ~ Ephesians 1:5; and “In whom also we have obtained an inheritance, being predestinated according to the purpose of him who worketh all things after the counsel of his own will: That we should be to the praise of his glory, who first trusted in Christ.” ~ Ephesians 1:11-12). Biblical Faith is the only sure foundation for the Christian walk. It is going back to the basics of understanding that real Biblical Faith is a complete reliance upon God for every need: that glorifying Jesus as preeminent (John 5:39) is a fulfillment of our true purpose in life (as opposed to finding purpose simply as an extension of keeping the attention on ourselves, or focusing on purpose, as opposed to Him), that dying to self by putting others first is a sincere act of love (1 John 3:16); that of getting back to the authority of God’s Word (Hebrews 4:12) in every aspect of our lives – these are what is meant by getting back to Biblical faith. I am constantly struggling to remember the big picture. If you live each day with it in mind, the typical daily trials and tribulations become much easier to get through.